About four years ago I made a very difficult phone call. JL and I decided it was time to have NHL evaluated with Early Intervention. Our little guy had been talking sentences for quite some time, but he could not walk on his own. He had no real ability to balance if a finger was not held by an adult. After a while, daycare convinced me that it could not hurt to see what happened. For weeks we worried. Was there something more wrong with NHL’s legs. We went to pediatric neurologists to rule out many different items. They all agreed that it did not present itself like CP or MD. Instead, they believed that he was hyperflexible and had low muscle tone. Their thought was that with some major physical therapy he would not only be able to walk, but eventually catch up to his peers. NHL has been receiving physical therapy for almost four years. He walked on his own just a few weeks after starting (fluke) right before his second birthday. Soon he was running, jumping came quite a while later and just this weekend we added bike riding to the list. If you saw NHL with a group of his peers, you would never know he had low muscle tone. These days the only thing that lets us know is gets tired more quickly than other children. This is because his body works extra hard just to stay upright and balance – without adding walking/running/jumping into the mix. We often forget about this and do not understand why he gets tired and a little grumpy after a long day at school or when we go running around on errands. 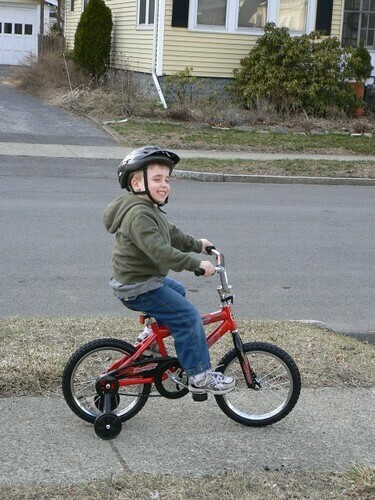 Here is NHL getting ready to test out his new bike at home for the first time. Helmets are a must before getting on. Even JSL was happy to be outside in the gorgous weather to watch his big brother. 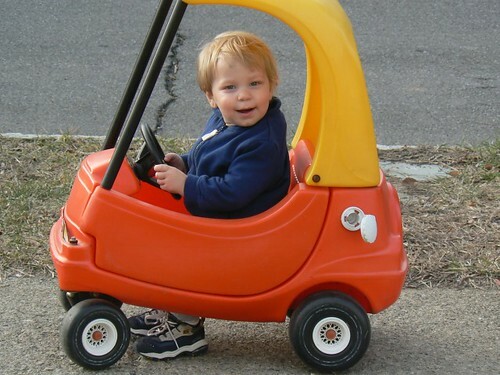 He loved following everyone in his "car car" after being cooped up in the house for the week. Next thing I knew, NHL was off . . . riding his bike down the block. The smile on his face made us feel so great. We think that secretly he had always wanted to ride a bike, but was too frustrated to ask. Finally his dreams were coming true thanks to all of his hard work in physcial therapy. NHL was so proud and wanted to show everyone his new bike. At first he asked for a few pushes to give him some momentum. Then he teased JL, asking for help and then riding off just as he arrived at the bike. Yes, he really was riding a bike and kept it up until the sun was going down. 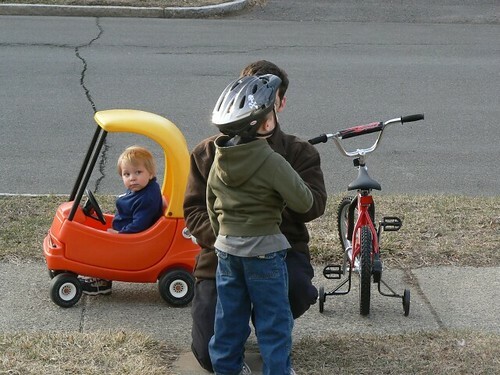 Now NHL hopes that the rain will stop and it warms up so he can enjoy the so-called spring with his new bike and little brother following along in his car. Thank you to all of the therapists that have helped NHL to come so far! Wow he has made some excellent progress and you can just tell how happy he was to be on that bike. It is great he is learning that with hard work, you can achieve your goals. PS Also glad to see the little guy doing better! That’s wonderful!! Therapists are truly a godsend. I’m so sorry I haven’t been here in a while….for some reason your feed isn’t updating in my Bloglines, so I’m going to try subscribing again. Glad to hear he is doing so well! That’s great! 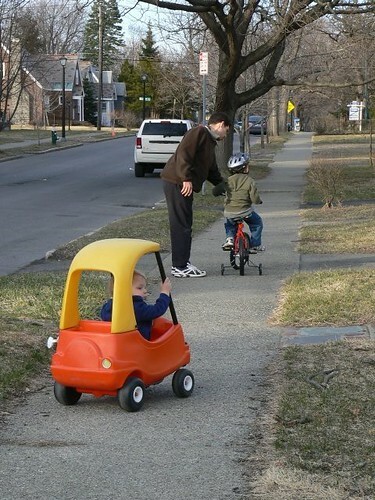 We took the boys out this weekend too for the first bike ride of the season, Zach rode on his trike while I pushed it. Good to see NHL enjoying his new bike! That’s awesome! Definitely a milestone to be proud of and celebrate! Sarah Berry’s last blog post..Wordless Wednesday – Brea’s 1st trip to the beach! What a wonderful story! I have back trouble and was scared to go to PT at first but I’m so glad I did! It was a fantastic experience and I don’t think they’re praised enough. 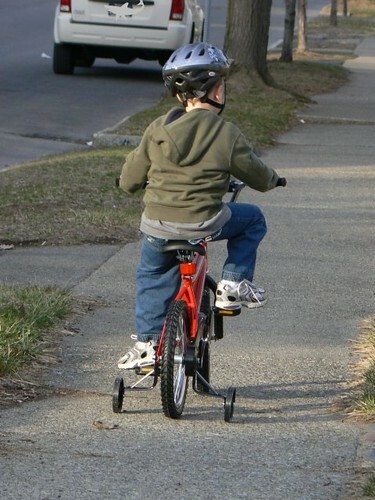 Congratulations to NHL for learning to ride a bike! Jennifer S.’s last blog post..Steak and Ale "Pie"